Francis, Daniel. "Woodstock (Ont)". The Canadian Encyclopedia, 04 March 2015, Historica Canada. https://www.thecanadianencyclopedia.ca/en/article/woodstock-ont. Accessed 18 April 2019. Woodstock, Ont, incorporated as a city in 1901, population 37 754 (2011c), 35 822 (2006c). 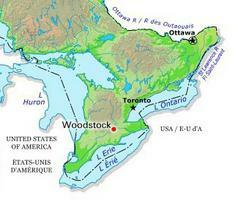 The City of Woodstock is located on the Thames River, in the heart of southwestern Ontario. 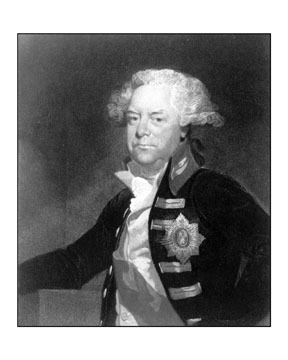 In 1793 John Graves Simcoe, impressed with the elevated terrain, designated the area as a potential townsite. The first settlers, Zacharias Burtch and Levi Luddington, both Americans, arrived in 1800 and were followed by other American settlers. In the 1830s, retired army and navy officers from England and British settlers were encouraged to settle here. In 1834 British Admiral Henry Vansittart arrived and named the village in honour of Woodstock, Oxfordshire, England, where he had been educated. It became the seat of Oxford County in 1839. The census of 1851 placed the population at 2112 and Woodstock was officially proclaimed a town. A major point in development came in 1853, with the arrival of the Great Western Railway; rail connection to Toronto came in 1880. Located in the heart of a rich farming area, the town was a milling centre in its early years. Industries included rope, woollens, barrels, soap, candles, harnesses, carriages, furniture and organs. The Woodstock Iron Works were established in 1842. Standard Tube (now ArcelorMittal), still in operation, dates back to 1905; it was the site of Canada's first electrical resistance welded tubing. Its industrial variety, which prompted the city to dub itself the "Industrial City," has continued with a mixture of light industry centered on the automotive sector. The yellow-brick town hall (built 1853) is a national historic site and houses a museum. WoodstockThe official website for the City of Woodstock, Ont.